every step you take moves us one step closer to a cure for Parkinson's. A map of the route can be found HERE. Registration for each adult participant is $40 and each child participant (13 years old and under) is $20. Everyone is encouraged to fundraise to help speed a cure! Online Registration will close on March 9 at 12:00 p.m. Participants who choose to fundraise have an opportunity to qualify for the official 2019 Fox Trot Recognition Program. To qualify as an individual, all fundraising must be reflected on your individual fundraising page. If you are on a team, your individual fundraising totals will count towards the team fundraising totals, but team totals do not count towards individual recognition eligibility. 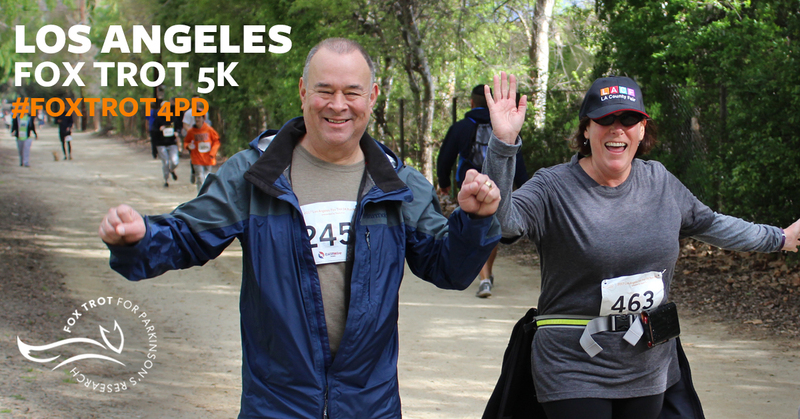 With Online Registration (Walk up registrations will not be eligible- Online Registration closes on March 9 at 12 p.m.) – Receive an official Fox Trot 5K T-Shirt. Raise $250 on your individual page (by March 8) - Receive an official Fox Trot 5K baseball hat. * Amount must be reflected on your individual and/or team page two weeks prior to your event date. **Amount must be reflected on your team page three weeks prior to your event date. WALK UP REGISTRATIONS ARE WELCOME! Registration Start Time: 8:00 a.m.
Run/Walk Start Time: 9:00 a.m.
*PLEASE NOTE: Run/Walk takes place on a non-paved path.